When I was preparing to apply to become a chartered member of the Institution of Civil Engineers, a mentor – I think as a warning against complacency – challenged me that I should be reading at least 6 books about engineering a year. From my experience, most engineering books are text books, so I asked him which books he suggested, and he couldn’t think of a single example of a readable book about engineering! I’m a great lover of short books, especially those that can be read in a single sitting, and this is one such pearl. Anthony Hunt was a famous structural engineer who had his own practice that worked variously with Norman Foster, Richard Rogers and Nicholas Grimshaw. His notebook is slimmed down minimalist introduction to the principles and possibilities of structural engineering. 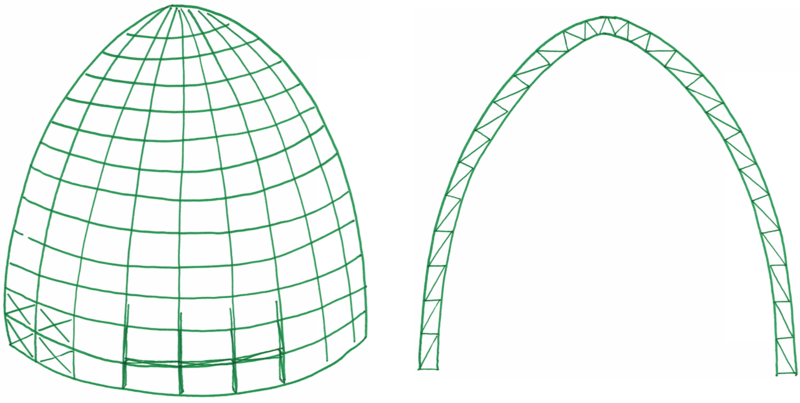 Mostly simple line sketches with a few words of description it goes through step by step from simple ideas (shear, bending, flexure..) to how they can work themselves out in practice (shells, barrel vaults, nets..). I use it at work to induct placement students as it takes less than an hour to read. This is a paperback by JE Gordon – one of the founders of materials science – draws on his diverse experience to explain a wide variety of engineering principles. I read this book about ten years ago, so my memory is a little hazy but I remember a section on dress-making to explain stress lines and his discussion based on first hand experience of the merits of welding vs. riveting, which was very interesting to think about the practicalities or making and checking that the joins are good. The book is a typical sized paperback, which took me a few hours to read. I remember enjoying it and have since recommended to at least one person who was wondering about whether to become an engineer. Each chapter of this book is dedicated to a different engineering failure and the lessons that were learnt from it. Although this might be interesting to the casual reader, it’s probably most useful to structural engineers so they learn not to repeat the mistakes of the past. Hardback with colour pictures and large font it was easy to read and I hope I learned some lessons from it! The chapter on the Hyatt Regency Walkway Collapse particularly sticks in my mind. The author – Henry Petroski – a professor of civil engineering at Duke University has written several books which could be candidates for this list, although so far this is the only one I’ve read. I think the title is a clever play on the phrase “to err is human” and the book is a discussion about engineering mistakes and what we can learn from them. He draws on a wonderful breadth of stories from around the world and his own experience. I’ve written a more thorough book review of it here. Lots of meat, without the maths that makes it hard to swallow. Petroski’s books then are rare gems of attempting to span that large distance between the remote island of engineering knowledge and the mainland of public imagination. Reading it as a structural engineer there was plenty that I was already familiar with, but also lots that was new. He draws on examples from both sides of the Atlantic, so having learnt my trade in the UK I found the discussion of iron bridges particularly Othmar Ammann (Quebec Bridge) and the Roeblings (Brooklyn Bridge) fresh and new. While others may be less familiar with Beauvais Cathedral, cracks in Big Ben or Paxton and the Crystal Palace. His opening chapters suggest that the book is for a non-technical audience, but he sometimes lapses into advice for professionals such as lamenting that our drawings are no longer as beautiful as Galileo’s. The vocabulary is probably only accessible for teenagers and up (discussion of monographs, commissions, cantilevers etc.) but other than that, in my opinion it is accessible for a non-technical reader. If I was being picky, I would like to have seen an over-arching story arc. Like there is in the excellent Fermat’s Last Theorem, which keeps you turning the pages. Petroski has research and includes an impressive amount of breadth – references to nursery rhymes, poetry, photos, quotes and lots of stories – but there is no one thread drawing it all together. I think it could also benefit from more detail of the human side of the characters. For example my impression is that Brunel was quite a risk taker, he sought his father’s advice for the Clifton Suspension Bridge, but then ignored it when he was advised to include a central support; which was quite bold for a 20-year-old designing the longest spanning bridge in the UK! So in summary, this book is a good introduction to engineering with plenty of nuggets and reminders for the more seasoned professional. It’s not a gripping page turner because there isn’t an over-arching narrative arc, but I enjoyed reading it and got several pages of quotes and stories from it that have broadened me out a bit and I’ll no doubt use again.